To say that I love washing my cloth diapers would be a lie. Laundry is laundry. But I do love that laundering cloth diapers isn’t nearly as intimidating, challenging, or gross as I would have predicted. That being said, I promised a tutorial on how to wash cloth diapers a long time ago so here we go. I must say that I’m happy I waited to write this blog. I’ve learned a lot in the last year. I’ve gone from a regular washer/dryer, to HE. I’ve tried a couple of different detergents, and I’ve dealt with a number of different brands of cloth diapers. I’ve also found a few different sources for help that I feel the need to share. Well, I don’t wash cloth diapers every day, but that’s because I’ve got a decent fluff stash. I have about 25 diapers, which means I can get away with washing once every three days. Granted, that’s now that Ginny’s a bit older. For the first six months, I really had to wash every other day. Then you throw them in the dryer on the lowest heat setting you have. A lot of cloth diaper moms like to line dry their diapers, and that’s great, but it’s hard to do in the winter. However, drying diapers in the sun does wonders for getting any remaining stains out of them. Personally, I dry the diapers in the dryer all year long, and then hang dry them in the sun during the warmer months to bleach them if needed (which really hasn’t been often). I feel the need to note that not all cloth diapers are created equal. Some need a little extra care, or have different manufacturer’s instructions (which you should carefully read). But I find this method works for my diaper stash, and from what I’ve read, it’s the standard recommendation. This was my biggest hang up when I first started thinking about cloth diapering. Then I found out, much to my surprise, that until you start adding solid foods into your baby’s diet, you just throw the whole diaper in the wash, poop and all. Weird, huh? I realize that grosses a lot of people out, but think about all the soiled clothes you throw in the washer on a regular basis. There’s all sorts of stuff that goes in there. Dirt, mud, food, vomit, spit-up, “blowout” collateral damage, unmentionables that get on the rest of your family’s undies…and you put that in your washer, right? Breastfed/formula poop has the consistency of, oh, I don’t know, mustard? So it’s water soluble and goes right through the washer without a problem. Now once you start adding solids, things become a little bit trickier. The more solids your baby eats, the chunkier the poop. And you don’t want the solids in your washer. Sometimes it falls into the toilet with just a little shake. Sometimes it needs a little more help to get off the diaper. There are a couple of different diaper sprayers on the market, which actually attach to the pipes under your toilet and therefore have a ready supply of water that you can use to spray the poop off (such as the bumGenius Diaper Sprayer). We just use a garden sprayer, which we keep next to the toilet and refill every time the water runs out. That seems to do the trick, though it’s not the prettiest bathroom decoration. There is this amazing product on the market called a wet bag. Honestly, I’d be using these even if I wasn’t cloth diapering, because they’re amazing at keeping the smell of diapers contained. And they’re completely washable. I wash mine all the time. A wet bag is basically just a zippered bag that keeps any moisture and smell inside. You can honestly put one of these things in the sink, fill it with water, and watch as nothing drips out the bottom. They’re that good. I have two large wet bags (though I just ordered another), and one medium wet bag that I keep in my diaper bag. When I take a diaper off Ginny, I pull the insert out of the pocket diaper and throw it in my wet bag (if I leave the pocket in the diaper, it won’t wash). If there is any solid poop, I dump/spray the poop in the toilet, remove the insert, then put both in the wet bag. Before introducing solids, the whole diaper, poop and all, went in the wet bag. My nursery only smells when there are dirty wipes in the trash bags. I’m telling you. Wet bags. Magical. And you literally just wash them with the rest of the diapers on the same rinse/wash/rinse cycle. I recommend Planet Wise, because that’s what I have and what was recommended to me. I love their prints, and though I was warned they’d wear out, they haven’t yet. I did have to give the zipper on one of them a little TLC (well, my mother-in-law did because she’s amazing with that kind of thing). Other than that, they’re still in great shape after a year of constant use. I could honestly write an entire blog on the subject of cloth diaper-safe detergent, because there is so much out there (opinion-wise). Some people will use special detergents made for cloth diapers, and won’t touch anything else. Some use standard detergents (usually the free & clear version), such as Tide. Some are really bullheaded about the best way to go. I’ve done both. 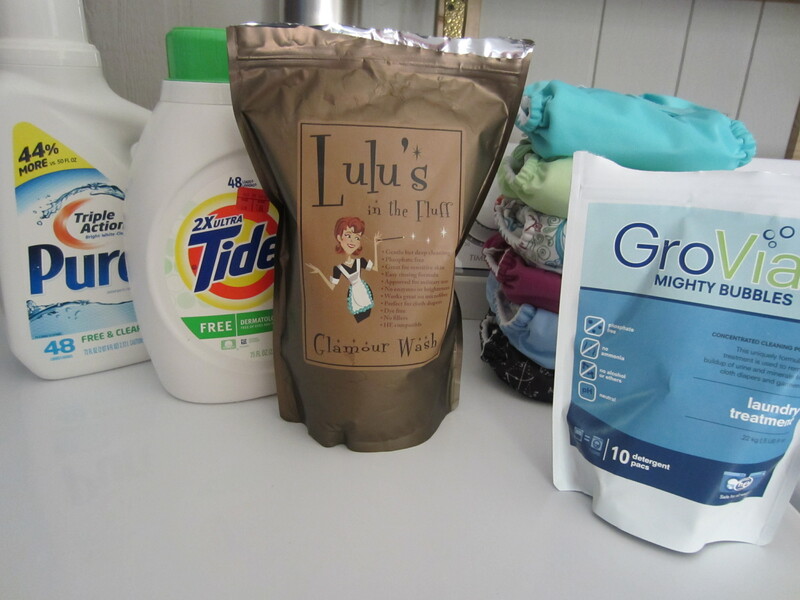 I usually use a special cloth diaper detergent (as I mentioned previously, my favorite so far is Lulu’s Glamour Wash), which costs about twice as much as Tide, but lasts a really long time (I had two $15 bags last six months, each). But when I run out, or, when I want to wash towels with the diapers, I’ll use either Tide Free & Gentle, or Purex Free & Clear. Honestly, I think you should do what you’re comfortable with. I should also mention that you should carefully read and follow your manufacturer’s instructions if you’re concerned about preserving your warranty. A great post! I’ve recently taken the plunge back into fluff (I struggled to keep up with the laudry before) and it’s so much easier now he’s older. Glad you liked it! 🙂 As for it getting easier, you sure do get a break from all the laundry when they go through less diapers in a day. I’ve been using stay-dry inserts on a pretty regular basis as well, so that really helps with the #2 diapers. When there’s a particular messy diaper that doesn’t just plop into the toilet and needs to be sprayed, it’s a lot easier to deal with. So that’s another idea to make things a little simpler.